Storytelling in Organizations is a Special Interest Group (SIG) of the National Storytelling Network. We provide a breadth of knowledge in storytelling and applications for organizations that is nowhere else available. 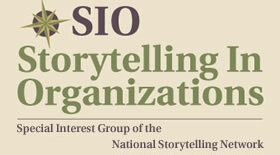 SIO SIG members are organizational leaders, psychologists, business managers, consultants, scientists, engineers, communication directors, marketing executives, human resource professionals, educators, performing storytellers and story coaches who come together in conversation and conferences to contribute to the emerging field of story work in organizations. We learn from each other across application domains, across technologies, and across cultures. We are dedicated to the expression, development and sharing of the many ways story and storytelling are applied in the world of business. This includes areas such as leadership development, sales, marketing, human resources, motivation, organizational analysis and change, research/innovation, and design.